Summary: Today was another active burning day. Firefighters and resources were assigned to areas where the potential for success is the highest and there is acceptable risk to firefighters. Silver Creek Road, on the western flank, is being prepared as a contingency with feller-bunchers. A feller-buncher is a logging tool that can rapidly cut and stack standing trees. A combination of hand crews and dozers worked in the Moyer Basin area to connect the fire into the 2011Salt fire where the fuel type change will slow or stop the fires progress. To the south crews worked to improve dozer line and hand line to connect to the Van Horn fire burn scar, creating an anchor point from which to engage the fire. 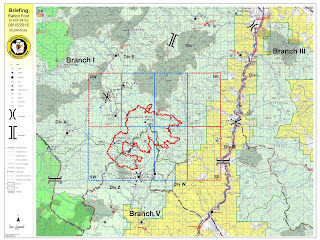 Resource Advisors coordinated with the Forest Service and fire personnel to develop strategies to create contingency lines on the eastern flank of the fire. 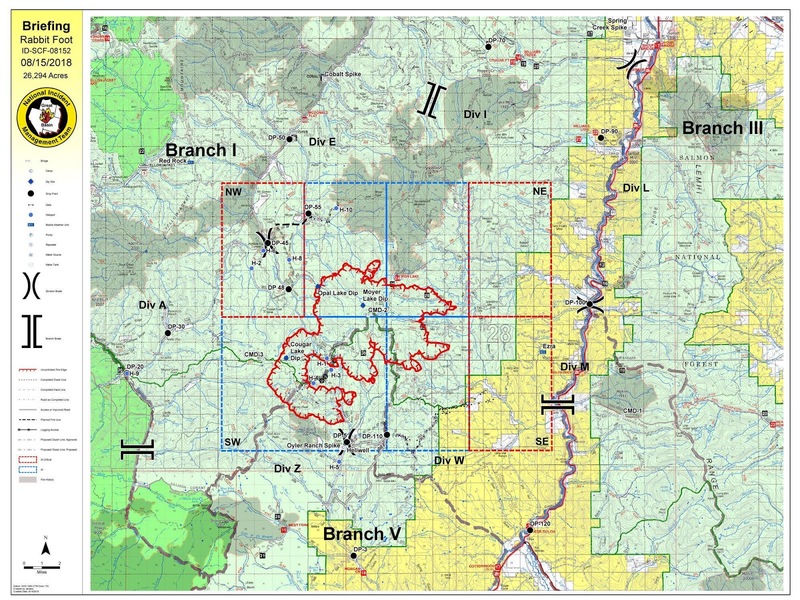 Planning focused on utilizing areas where roads, natural features, and changing fuel types can be used for establishing anchor points as well as constructing indirect fire lines. Structure teams continued to assess private and public infrastructure and are developing site specific strategies. Air operations logged 39 hours of flight time using helicopter water buckets drops to quell active burning areas. They also delivered a new mountaintop radio repeater, enhancing fireline and assessment crew communication capability. Firefighter and public safety remain the top priority of this incident. The public meeting in Salmon was well attended by more than 100 people and a good exchange of information occurred. Weather: A Fire Weather Watch has been issued for tomorrow and there is a possibility for isolated thunderstorms with limited potential for rain and increased chances of lightning. Afternoon wind speeds are expected to be 6-10 mph, with outflow winds as high as 50 mph near the thunderstorms. Humidity will dip into single digits, increasing the chance of ignition from wind-driven embers to up to 100%. Temperatures may range from 70 - 80 degrees across the fireline. Closures: Stage One fire restrictions remain in effect on the Salmon-Challis National Forest, Bureau of Land Management, and State lands. Fire related area closure orders remain in effect and have expanded in response to the new fire growth. For more information on fire restrictions and area closures, visit Inciweb or the Salmon-Challis Facebook page. (https://www.facebook.com/salmonchallisnf/). Temporary Flight Restrictions (TFR): Temporary Flight Restrictions (TFRs) for non-incident aircraft including drones remain in effect. Pilots see NOTAM #8/6037.